Seller: giftdotnet (7,763) 100%, Location: Westbury, New York, Ships to: US, CA, JP, FR, AU, Item: 303045145592 SquareTrade © AP6.0 BUY A MINT CONDITION NEW UNCIRCULATED 50000(FIFTY THOUSAND) IRAQI DINAR BANKNOTE PLACED IN A "HEAVY DUTY" PLASTIC HOLDER VIEWABLE FROM BOTH SIDES. CERTIFIED TO BE AUTHENTIC AND GENUINE NEW IRAQI CURRENCY NOTE INTRODUCED BY THE CENTRAL BANK OF IRAQ ON NOVEMBER 11th. 2015. WE OFFER FREE SAME DAY SHIPMENT VIA FIRST CLASS MAIL WITH DELIVERY CONFIRMATION FROM NEW YORK!. Be sure to visit our Ebay auctions for Iraqi Dinar Currency Notes/BUNDLES/Coins, Vietnam Currency POLYMER Banknotes and pure Gold & Silver Gift items. Bid with Full Confidence. All items carry 100% Money Back Guarantee. Please click here TO SEE ALL MY AVILABLE AUCTIONS. 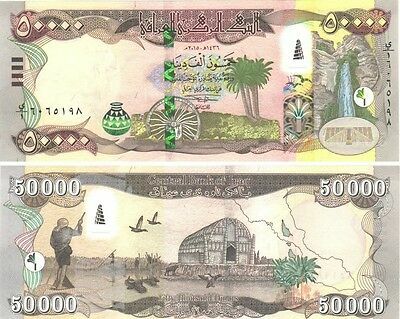 THOMAS DE LA RUE COMPANY has officially printed all New Iraqi Dinar banknotes. ALL OUR 50000 DINAR BANKNOTES HAVE BEEN CHECKED AND CERTIFIED TO BE AUTHENTIC & GENUINE ON THOMAS DE LA RUE MACHINE AND LEGALLY IMPORTED THROUGH U.S. CUSTOMS and are available here EXCLUSIVELY. YOU WILL NOT FIND THIS OFFER ANY OTHER PLACE ON EBAY! On October 15. 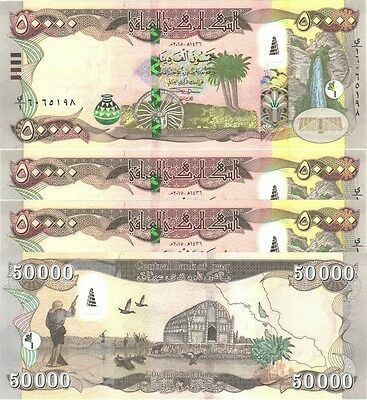 2003, the new Iraqi Dinar Banknote series in the denominations of 50, 250, 1000, 5000, 10000 & 25000 were launched by Central Bank of Iraq. 50000 DINAR BANKNOTE WAS INTRODUCED ON NOVEMBER 11TH. 2015. The new banknotes, printed in Britain, boast of the most up-to-date anti-counterfeit features, including watermarks, a security thread, raised letters, an optical variable ink and other variations to thwart counterfeiters. The new currency is one currency for the entire country of Iraq. 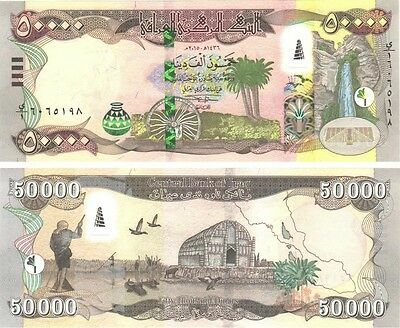 You are buying 1 x 50000(FIFTY THOUSAND) Dinar Banknote. This is an uncirculated note from a serially numbered bundle and makes a great collectible item for someone who enjoys world currency notes. MINT 50000 NEW IRAQ IRAQI DINAR NOTE - CERTIFIED! FRONT: Assyrian jar as blue-to-green SPARK patch; water wheel on the Euphrates river; palm trees; flying birds; Gali Ali Beg waterfall in Kurdistan; Assyrian palm tree as registration device. BACK:Assyrian palm tree; fishermen poling canoes through marshes with flying ducks, water buffalos, reed house; outline map of Iraq showing Euphrates and Tigris rivers; palm trees. varifeye thread with spiral minaret, Malwiya Tower, at the Great Mosque of Samarra. 4-mm wide purple-to-green RollingStar Cube windowed security thread with demetalized Arabic text (The Central Bank of Iraq). Watermark: Horse head and electrotype 50000. EACH WINNING BIDDER WILL RECEIVE ONE(1) AUTHENTIC CRISP NEW 50000 IRAQI DINAR BANK NOTE FROM SEQUENTIALLY NUMBERED BUNDLE. EACH NOTE IS INDIVIDUALY PACKED IN A PROTECTIVE "SUPERSAFE" PLASTIC HOLDER, VIEWABLE FROM BOTH SIDES. 100% SATISFACTION GUARANTEED. Actual ebay feedback: "Great Dinars, checked out fine. Good transaction well satisfied #A1." "Great Packaging, Notes Look Fine, Honest E Bayer,Thanks !!!!!!!!!!! !” "Perfect transaction! Highest possible recommendation." "This is a first class ebayer. I cannot say enough good about them ++++++++++” "Superb transaction, fast shipping, careful packaging, highly recommend.” "Seller has prompt shipping and the product was exactly as described. Good Ebayer” "Item was described perfectly...and I received it very quickly.” "Note was as stated very happy with my buy, will buy again in the future! !” "Thank you so much and you packed it beautifully.” "Everything arrived in perfect condition and on time. Recommended.” "Fast transaction, quick delivery. Item is exactly as described." "Fast shipping! Excellent buying experience - would buy from again!” and Thousnads more! Please realize that you are viewing the photographs at 72 dots per inch (dpi), and your computer screen cannot show the real quality of these notes, at least not on the internet. However, I guarantee the quality of each note, and if you're not satisfied, send it back and I will refund your money (less shipping). We accept Paypal Payment. MY GUARANTEE: We are convinced that you will love this note. If you are not 100% satisfied, we will refund 100% of your product cost once we receive it back (less shipping). NO QUESTIONS ASKED. Bid with full confidence, I am a Registered Square Trade Member. Please feel free to check my feedback. Condition: UNCIRCULATED. MINT & CRISP. COLLECTIBLE QUALITY. FREE S&H WITH TRACKING., Country: Iraq, Type: Legal Tender Currency Banknotes, Circulated/Uncirculated: Uncirculated, Dinar: New Iraqi Dinar, CRISP & MINT BANKNOTE: EACH NOTE PLACED IN A "SUPERSAFE" HOLDER! Popularity - 717 views, 8.6 views per day, 83 days on eBay. Super high amount of views. 7 sold, 3 available. 717 views, 8.6 views per day, 83 days on eBay. Super high amount of views. 7 sold, 3 available.